J.R. Wolkin. (2015) Cultivating multiple aspects of attention through mindfulness meditation accounts for psychological well-being through decreased rumination. 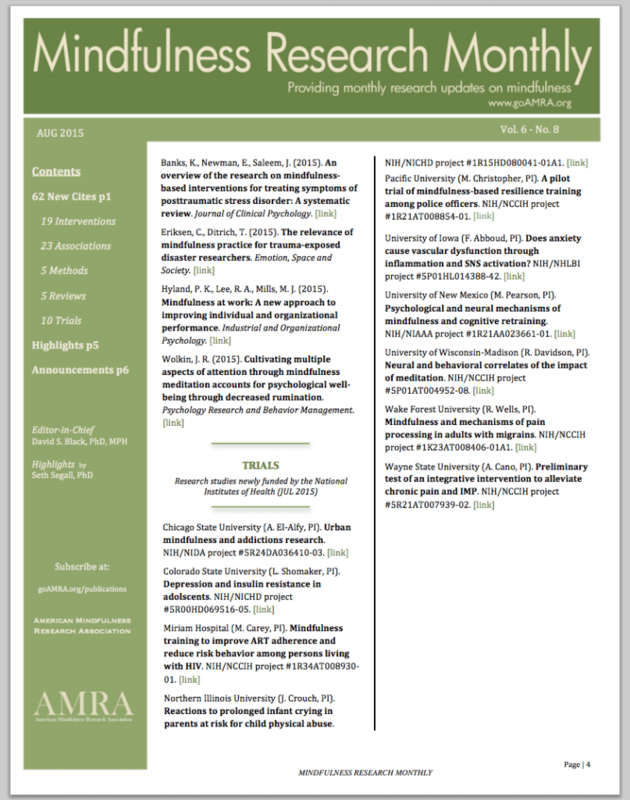 Review cited on Mindfulness Research Monthly of American Mindfulness Research Association, AMRA. R.M. Shane, J.R., Wolkin, R.J., Bodnar (2002). Reduction in OFQ/N1-17-Induced Analgesia Elicited From the Amygdala by Pretreatment With Mu, Kappa, and Delta Opioid Antagonists in Rats. Analgesia. J.R. Wolkin. 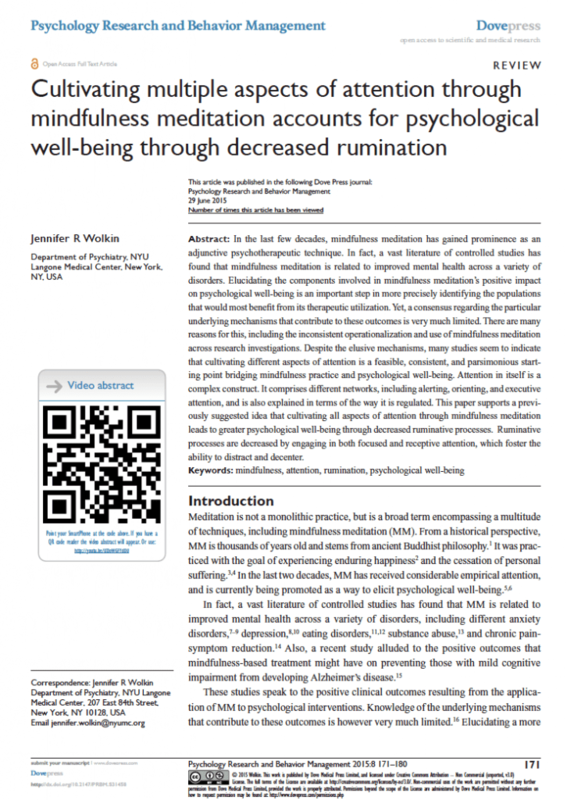 (June 2015) Cultivating multiple aspects of attention through mindfulness meditation accounts for psychological well-being through decreased rumination. Review published on Dove Medical Press. Wells RE, Yeh GY, Kerr C, Wolkin J, Davis RB, Tan Y, Spaeth R, Wall R, Walsh J, Kaptchuk T, Press D, Phillips RS, Kong, J. Meditation’s impact on default mode network & hippocampus in mild cognitive impairment: a pilot study. Neuroscience Letters 2013, Oct 10. [Epub ahead of print]. Rebecca Erwin Wells, MD, MPH*, Gloria Y. Yeh, MD, MPH, Catherine Kerr, PhD, Jennifer Wolkin, PhD,Roger B. Davis, ScD, Ying Tan, PhD, Robert Wall, Jacquelyn Walsh, Ted Kaptchuk, Daniel Press, MD, Russell Phillips, MD, Jian Kong, MD, MPH (June 2012). Meditation for Adults with Mild Cognitive Impairment: A Pilot Randomized Trial. Accepted as a letter in the Journal of the American Geriatric Society. A.M. Hollis, A.K.W. Lee, L.R. Kapust, L.K. Phillips, J.R. Wolkin, M.G. O’Connor (2013). The driving competence of 90 year old drivers. Traffic Injury Prevention. Rebecca Erwin Wells, MD, MPH*, Gloria Y. Yeh, MD, MPH, Catherine Kerr, PhD, Jennifer Wolkin, PhD, Roger B. Davis, ScD, Rosa Spaeth, Ying Tan, PhD, Robert B. Wall, Jacquelyn Walsh, Ted Kaptchuk, Daniel Press, MD, Russell Phillips, MD, Jian Kong, MD, MPH. Stress Reduction Through Meditation May Aid in Slowing the Progression of Alzheimer’s Disease. 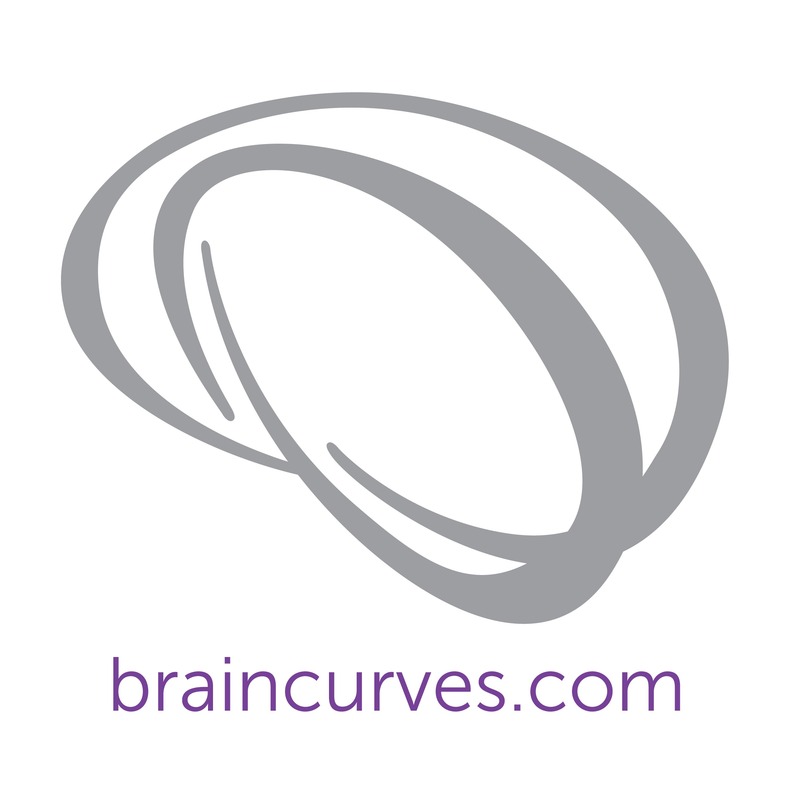 Beth Israel Deaconess Medical Center pilot study shows promise for age-related cognitive diseases (November 2013). Rebecca Erwin Wells, MD, MPH*, Gloria Y. Yeh, MD, MPH, Catherine Kerr, PhD, Jennifer Wolkin, PhD, Roger B. Davis, ScD, Ying Tan, PhD, Robert Wall, Jacquelyn Walsh, Ted Kaptchuk, Daniel Press, MD, Russell Phillips, MD, Jian Kong, MD, MPH. A Randomized Trial: Effect of Meditation on Neural Networks in Mild Cognitive Impairment. Mindfulness (at UMASS) 11th Annual International Scientific Conference for Clinicians, Researchers and Educators (April 2013). Rebecca Erwin Wells, MD, MPH*, Gloria Y. Yeh, MD, MPH, Catherine Kerr, PhD, Jennifer Wolkin, PhD, Roger B. Davis, ScD, Ying Tan, PhD, Robert Wall, Jacquelyn Walsh, Ted Kaptchuk, Daniel Press, MD, Russell Phillips, MD, Jian Kong, MD, MPH. Impact of Meditation on Default Mode Network [amp] Hippocampus in Mild Cognitive Impairment: A Randomized Trial. Accepted for a poster presentation at the American Academy of Neurology 65th Annual Meeting (March 2013). J.R. Wolkin, P.C. Mayer. Building a Church without Bricks: A meaning-centered group with Parkinson’s disease patients. Accepted as paper session presented at the American Psychological Association annual convention (August 2011). A. K. W. Lee, L.K. Phillips, J.R. Wolkin, A. Hollis, L. Kapust, M. O’Connor. The 90 Year Old Driver: The “Oldest Old” is the New “Old”. Poster presented at the Massachusetts Neuropsychological Society annual conference (June 2010) and at the International Neuropsychological Society annual conference (February 2011). J.R. Wolkin, S.J. Hoffschmidt. Putting the Psychology Back into Neuropsychology. Poster presented at the Massachusetts Neuropsychological Society annual conference (June 2009). J.R. Wolkin, W.B. Barr, K.R. Alper, V. Zemon, O. Devinsky. Gender and Major Depression in a Sample of Epilepsy Patients. Poster presented at the American Psychological Association annual convention (August 2008). Wolkin, JR; Barr, WB; Alper, KR; Zemon, V; Devinsky, O. Gender and major depression in a sample of epilepsy patients.Clinical neuropsychologist 2008 SEP;22(4):747-747. J.R. Wolkin, W.B. Barr, K.R. Alper, V. Zemon, O. Devinsky. Assessment of Major Depressive Disorder in Patients with Epilepsy using the BDI. Poster presented at the International Neuropsychology Society annual convention (February 2008). J.R. Wolkin, W.B. Barr, K.R. Alper, O. Devinsky. Rates of SCID-Diagnosed Axis I Disorders in a Large Cohort of Patients with Epilepsy. Poster presented at the Fourth Annual Department of Psychiatry Research Day (September 2006). J.R. Wolkin, W.B. Barr, K.R. Alper, O. Devinsky. Rates of SCID-Diagnosed Axis I Disorders in a Large Cohort of Patients with Epilepsy. Poster presented at the International Neuropsychology Society annual convention (February 2006). J.R. Wolkin, E.S. Schori, R. Holtzer. Cognitive Mechanisms Underlying Gait and Posture Control in Aging. Poster presented at 2nd Annual Yeshiva University Behavioral Sciences Student Research Conference Program (May 2005). R.M. Shane, J.R., Wolkin, G.C., Rossi, R.J., Bodnar (2001). Orphanin-Induced Analgesia Elicited From the Amygdala in Rats. Society for Neuroscience Abstracts, 27.